Every company that begins to embrace lean recognizes that their ultimate success is dependent upon the rate of learning and their engagement of people. This program is designed to directly address this issue. First, this program as a simulation makes learning fun, and adults learn and retain knowledge more effectively when they are having fun. Second, it focuses on the lean principles and skills that promote learning through action, a daily occurrence in a lean journey. 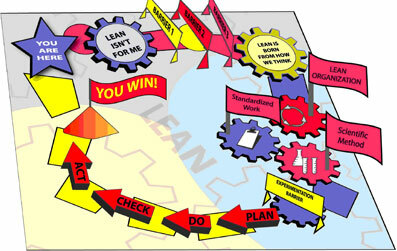 Third, it promotes immediate and small actions that people can take to begin their own personal lean learning journey. Through this program, you can get many people off the ground and running. We provide you with everything you need to run this program yourself, right out of the box. All of the materials needed to execute the program, including Game Board and all accompanying game pieces, Cups, Standard Work Instruction Tent Cards, Improvement Instruction Cards, Timer and Improvement Materials. As part of the initial package, you receive 5 complete kits, enough to support a class of 25 people, and can order as many additional kits as required. The Mouse Trap Experience is a 3-hour program that can be run with 6 to 100 people. Each game board can accommodate a team of 3-5 people with 5 being the ideal number. The program begins covering some of the typical barriers to lean. It then goes on to highlight the idea that lean is born from how we think. This point is important to help people understand that lean tools alone will not provide them with the outcomes they desire. The program moves on to its central message — that lean is about learning. Learning must occur through action at every level and every day. The detailed concepts covered include the scientific method, experimentation, standardization and Plan – Do – Check – Act (PDCA). This includes practical advice for how to put these ideas to work. This knowledge is now put to work for the 2nd half of the program with the Mouse Trap Simulation. This simulation brings to life these concepts visually for any individual. The non-manufacturing aspect of the Mouse Trap Simulation makes it equally applicable for any environment, whether manufacturing, administrative, healthcare, retail, education and more. The concepts of learning and the scientific method are equally important for executives and front-line associates. The program has been used in small work teams, to kick off enterprise software projects, and to introduce lean to executive teams. It can be integrated into your larger lean programs or used as a standalone event. Lean knowledge is not a prerequisite for the program, nor would lean experience diminish the learning that can be achieved. To allow you the maximum amount of flexibility, we provide options for purchasing a license that allows you to run the program as often as you want and for any range of participants. Additional game kits can be ordered for $47 per kit. Each game kit includes game board and all accompanying game pieces, tent cards, improvement guide, stopwatch, labeled cups, scissors, and tape.